At first glance a word like fennel seems pretty unambiguous. It's a plant with feathery yellowish-green foliage and yellow flowers that yields seeds with a distinctively spicy taste. Fennel is, in fact, often classified as a spice. Would that it were quite so simple. To begin with, there are two Mediterranean plants often referred to as "fennel," and one happens to be what Italians often call anise. Then there's liquorice - actually an Asian plant bearing no near kinship to the fennels - which has a flavour similar to anise root. The Italian "liquorice liqueur" called anisette is, of course, made from local "anise root," not liquorice bean, and the idea that it contains elderberries is, well, just an idea. 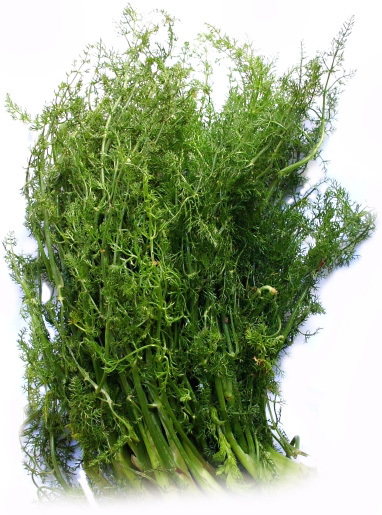 "True" fennel is the plant known scientifically as foeniculum vulgare, and this is a case where the English and Italian words come directly from the Latin. Here in Sicily it's often called finocchio di montagna or "mountain fennel." This perennial, which actually grows wild in many areas, is in the apiaceae family (formerly umbelliferae). Indigenous to the Mediterranean, it thrives even in relative dry climates. Mountain fennel (shown here) rather resembles dill and in Sicilian cuisine is is usually served with pasta or as an ingredient in fritattas. Then there's "Florence" or "Florentine" fennel. This is foeniculum vulgare azoricum, distantly related to plain old foeniculum vulgare. Treated as an annual, this more "domesticated" fennel has a large white bulb (known by the misnomer "anise root") at its base near the roots. It is aromatic and, apart from its medicinal use, is a basic ingredient in absinthe. The bulb is edible and tastes a little like celery, containing high levels of various minerals, particularly iron, calcium, potassium and magnesium. It is also rich in Vitamin C and Vitamin B9 (folate). The fennel bulb is popular in salads. It can be eaten raw but is sometimes grilled or baked. Florence fennel is not true anise, but let's leave such complexities for another day. Suffice it to say that the same substance, anethole, which give anise its flavor is present in Florence fennel. Liquorice, unrelated to either anise and fennel, is glycyrrhiza glabra, a legume. The Greek hero Prometheus made use of a fennel stalk to steal a flame from the gods. Perhaps that was the only kind of wood he could find. Mountain fennel has hollow stems and grows to a height of almost three metres. Fennel appears in the cuisines of the Middle East and Central Asia, including India, as well as China. Anethole is the medicinal component of fennel; its polymers act as phytoestrogens. And it tastes good enough that it is becoming known as something "exotic" outside countries where it is part of the traditional cuisine.